In August Harry and thirty-six other British, French and Belgian agents were deported to Saarbrucken camp on the German border, along with a group of women including Violette. After four days the men were sent on to Buchenwald concentration camp, where sixteen of them were executed a few weeks later. It became obvious that the remainder of the group would soon share the same fate. With the cooperation of an SS doctor, Erwin Ding-Schuler, and two prisoners, Eugen Kogon and Arthur Dietzsch, a plot was hatched to save three of the group by exchanging their identities with dead prisoners from the experimental typhus station, known as Block 46. 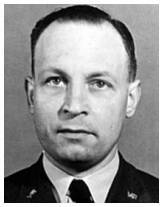 The leader of the group, Forest Yeo‐Thomas, was the first to be smuggled into the block by Dietzsch, followed by Harry and a French agent, Stéphane Hessel. Adopting the name of Marcel Seigneur, Harry was transferred to Schonebeck, a satellite camp on the River Elbe. Put to work in an aircraft factory, his attempts to sabotage the production lines soon condemned him to the punishment kommando, where he was forced to dig trenches in freezing conditions and endure harsh treatment from the SS guards. In April 1945 the Americans reached nearby Magdeburg and Harry successfully escaped from his working party, but as he approached the American lines he was stopped by two SS officers. Telling them that they would be shot wearing their uniforms, he was able to grab their weapons as they changed clothes and took them prisoner. Aside from Harry, Yeo-Thomas and Hessel, only three others from the original group of thirty-seven survived. For his actions, Harry was awarded the Distinguished Service Order, the French Croix de Guerre with palm, the Médaille de la Résistance and was made a Chevalier of the Légion d'Honneur.